Published in the South Kent Gazette, 19 September, 1979. The Commissioners refused to give that sum, but offered 12/- per superficial foot for such land as they might require, and, if Mr. Page would not agree, they would try the value before a jury. To that Mr. Page replied that if the Commissioners would allow him to excavate cellars five feet under the pavement, and to build out his wall in Bench Street in line with the “Shakespeare“ Hotel, he would give up three feet in depth to widen Snargate Street as far as his premises extended. That was agreed to, so that the widening of the top of Snargate Street three feet cost nothing in cash, but it was done at the expense of the perpetual inconvenience of having these cellars under the pavement. The business premises which Mr Page built in Snargate Street (in addition to his own) were immediately occupied by Mr R. W. Bennett, a high class draper, who, after five years, transferred this business to Mr John Haseldine, who, on the 1st of January, 1846, came to Dover with all the energy of youth and the reputation of a Regent Street training with every prospect of making the new shop a big success, but after more than forty years’ hard and well directed effort, he went out of it broken down in health, without a fortune. None of the firms who occupied the premises between the top of Snargate Street and Chapel Street in 1846 now remain. At that time the street list stood thus: No. 187, Stephen Carfrae, brazier and bellhanger; 188, J. B. Smart, clothier; 189, J. B. Batcheller, confectioner; 190, Charles Jones, gentleman 191, Edward Sclater, carver and gilder; 192, J. S. Neales, chemist; and 193, John Haseldine, draper. On the other side of the top section of the street, from the old library down to what used to be Wellington Lane, the 10 tenements presented an admixture of old and modern until enemy action devastated the area in the last war. Three were undoubtedly older than the last century, whilst the others had been wholly or partially rebuilt. From about 1844 Nos. 1 and 2 were connected with the library. At No. 3, was John Baker, perfumer, from Paris, who was the secretary of Dover’s first building society, which was established in May, 1846. Jacob Reuben’s famous bazaar was at Nos. 4 and 5; Madame Pacey, a fashionable staymaker, was at No. 6; Allen Colyer, a watchmaker, was at No. 7; at No. 8, was William Ingram, fishmonger; at No. 9, J. E. Webb, butcher; and at No. 10 (the corner), was the "Wellington Inn“, kept by John Culmer. THE PENT — AN OPEN SEWER. Jacob Reuben, of the Bazaar, gained fame through a letter he received from the Duke of Wellington. The Duke’s son, the Marquis of Douro, had left an unpaid account at Reuben’s Bazaar when he left Dover, and Reuben Bent the account to the Duke of Wellington, thinking that the easiest way of collecting the money. The Duke’s characteristic reply was as follows:— “Field-Marshall the Duke of Wellington presents his compliments to Mr Reuben, and begs to inform him that he is not the Marquis of Douro, neither is he the collector of Mr Reuben’s accounts.“ Mr. Reuben always said that he greatly preferred that letter to the money. The “Wellington Inn“ disappeared from Snargate Street in 1860. Wellington Passage used to be a useful cross-cut from Snargate Street to Northampton Street and to the rear of the "White Cliffs Hotel." As late as 1849 it was a semi-private place and today it is in private ownership again. There used to be gates at the end next to Snargate Street, the gates being intended to prevent the scavengers from depositing their town refuse in the Pent, and to deter the inhabitants from emptying their tubs of sewage in the same place. That was before the days of the Public Health Act, when Snargate Street on the north side, having no sewer, allowed liquid drainage to sink into the shingle, on which the houses are built, while the solid refuse was kept in tubs for the scavenger to fetch at twopence per tub, or thrown into the Pent. On the southside the Pent came up to their backyard doors, and the disposal of their sewage was a very simple matter. But although those gates were erected at the top of Wellington Passage (presumably by the Harbour Commissioners) to prevent a nuisance, the right to put them there was disputed; in fact, there was no real right, for in the olden times, when the Three Gun Battery stood where Batcheller’s Library was built, and New Bridge did not exist, the road through Wellington Passage was the old public road, leading by a ford across the top of the Pent to the seashore. Dr. Sankey’s house and surgery was next below Five Post Lane. When he removed to his new house in Camden Crescent in 1840, this house was then altered; from being a doctor’s residence and surgery it became the house and shop of a chemist. If we go further back we shall find that a Simon Yorke, merchant, was buried in St. James’s Church, in 1664. His son Philip, an attorney, resided in one of these Snargate Street houses, which our illustration shows as having many gables. The Yorke’s house was at the Corner, and although somewhat pretentious in appearance, was not a large mansion. 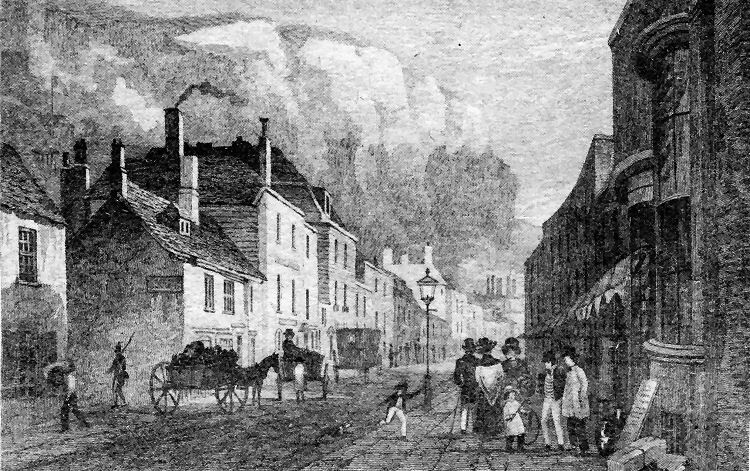 Snargate Street as depicted in an 1830 engraving of George Shepherd and showing a soldier walking towards the foot of the Grand Shaft spiral staircase to the barracks on the cliff-tops overlooking the street. Mrs. Yorke was a Presbyterian, daughter of Richard Gibbon, an ancestor of Gibbon the historian of the Roman Empire. Their son Philip Yorke was born in the house depicted in our illustration in 1690, and his mother, in planning his future, Objected to his being a lawyer, and intimated a desire that her son should be “put to some honester trade,“ and she expressed a hope of seeing “his head wag in a pulpit.“ Mr. Philip Yorke the elder, however, observed that his son was a “cute lad,“ and being of narrow means, he had him placed as an articled clerk without fees — “a gratis clerk“ he was called — with an eminent London attorney, Mr. Salkeld, of Brook Street, who was Mr. Yorke’s London agent. This is not the place to write a biography of the “cute lad,“; but it might be remarked that he made such strides that he soon became his master’s managing clerk, and in that capacity, coming in contact with Lord Chief Justice Parker, he by that influential lawyer’s favour, got an opportunity of being called to the Bar, entered Parliament, was made Solicitor-General, became Chief Justice of the King’s Bench, was created Baron Hardwicke, and was eventually appointed Lord Chancellor, in the year 1737; the exact time which it took this ’cute Snargate Street lad to successfully run this race from the Bar to the Woolsack was 22 years. A portrait of this celebrated Dover man hangs in the Maison Dieu Hall. 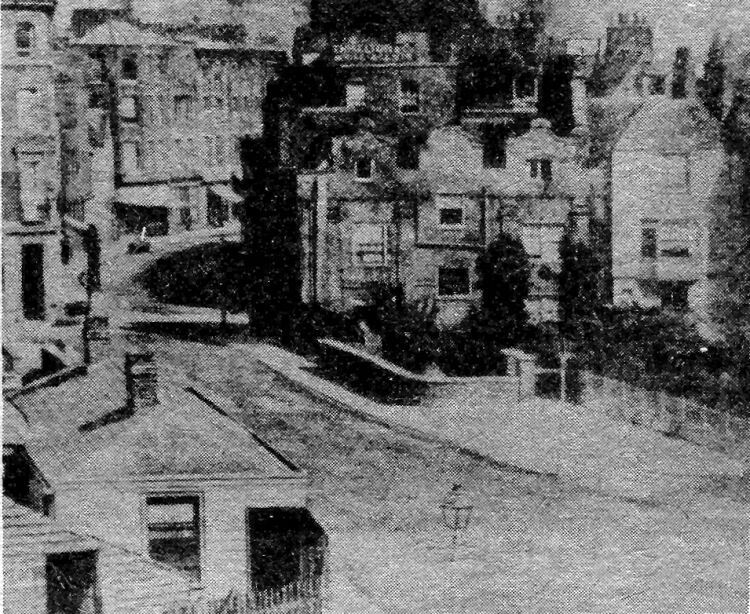 The picture is one of the earliest photographs of old Dover. Taken over 130 years ago (1850) it shows the narrow New Bridge leading into Bench Street and King Street. On the left, behind timber yard buildings of Steriker Finnis, is the corner of Page the grocer’s shop. Nearby was the site of Severus Gate, part of the old town wall, and in the centre is the office of Thiselton and Co, one of Dover’s earliest estate agents. The bridge in the foreground remained as shown until 1840 when the parapet was removed for building business premises on the site.